Friday Finish .... New Pattern in Process! Postcard Winner and some Oldies! Friday Finishes and New Pattern! It has been a slow week, sometimes family matters take precedence, but I was able to finish my new quilt piece today. I will work on the pattern so a release of that, will be later in the week. I want to keep the quilted pieces small so they can be printed out as is for a pattern. For this piece I used fusible raw edge. The pattern will include the crow punch. Unfortunately my brain is still crooked and the lettering is a bit wonky, but that was me and maybe a shift in the backing when I traced on the words. The saying came from an old poem and I reworded it to fit the piece. I thought it should be a fun piece and can be done with spring or fall colors. I would love your thoughts on the new piece, other than the fact that I cannot sew a straight line;) The pattern itself is straight. On another note, the postcard arrived at it's destination, with no damage. Tonight I made up another drawing that I can paint and maybe we can do another giveaway. It is fun to make them and I love sharing them with others. 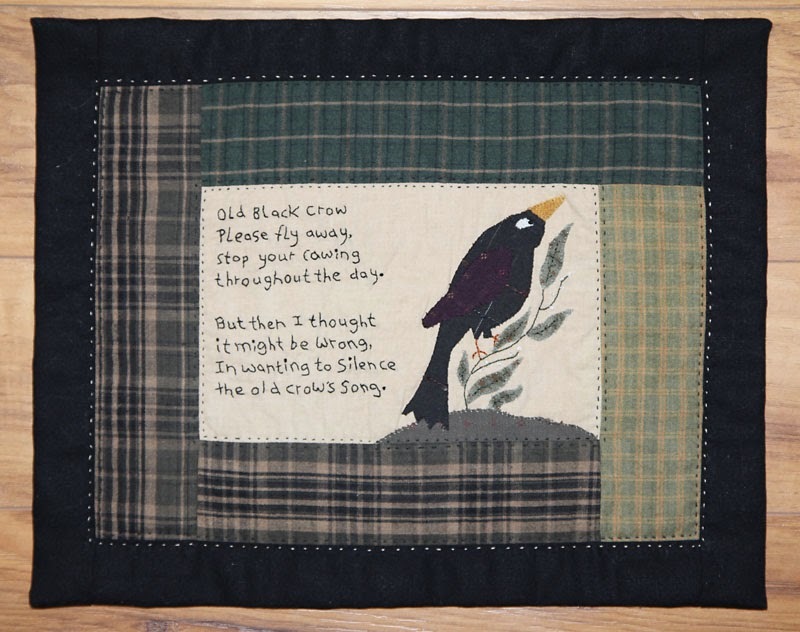 Jennifer made a beautiful frame to put hers in, you can see it at her blog, The Country Mouse. I started a new pattern last week and it has been slow going this week so the pattern won't be ready till next week. It will be a two part pattern including the punch needle which you can see below and a small wall hanging with applique and stitchery. Tonight I am showing the punch which I kept simple because I know many of you enjoy punch needle but not always the small details so I try and design them so they are easy to punch but still work into a nice design. 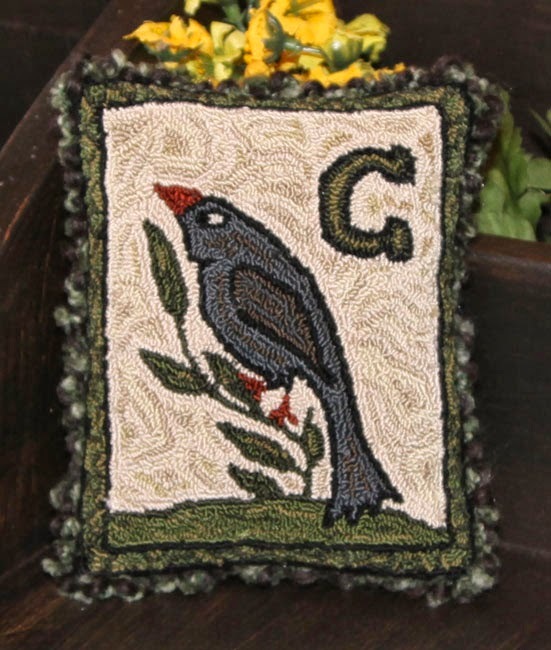 The original design was adapted from a fraktur but it turned into a crow piece. The accompanying piece will also have a saying. I also did a special border on the punch as well as a twisted yarn edge, and I will include the basic how to's in the pattern. This punch is messed up, I traced the pattern backwards for punching and then traced it from the right side and didn't realize it until I saw that the letter was backwards. I redid the letter but left the crow as is, so it might seem a bit off. The crow should be facing the other way and the C on his left. I did not antique this piece yet so I could get a clear photo of the piece for the pattern. I have enjoyed reading all of your comments and appreciate everyone wanting to help me out with testing a postcard. I love the idea of sending out postcards for fun and this will be a good test before I do more. I think I will have to have a giveaway once in a while with a postcard so those of you who didn't win can have another chance. And now for the winner..... Jennifer768 is the winner! Jennifer, please email me with your address and I will get your card out to you. Since we are talking frakturs and some of you have not seen my older work, I thought I would post a few frakturs that I did years ago and sold on ebay or giving as gifts. 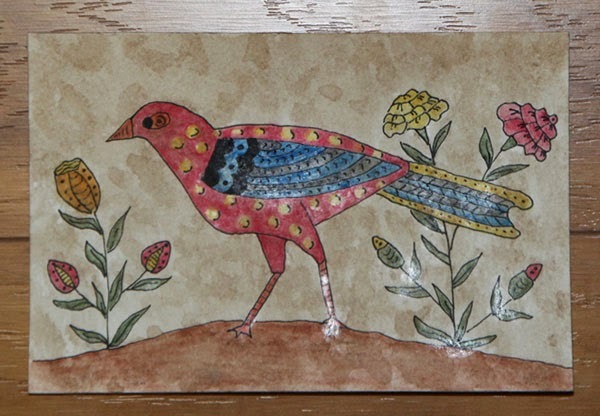 These are two birds that I did from antique frakturs. Sometimes I like to add sayings to mine. The photos are old and got corrupted, thus the discoloration on the bottom. 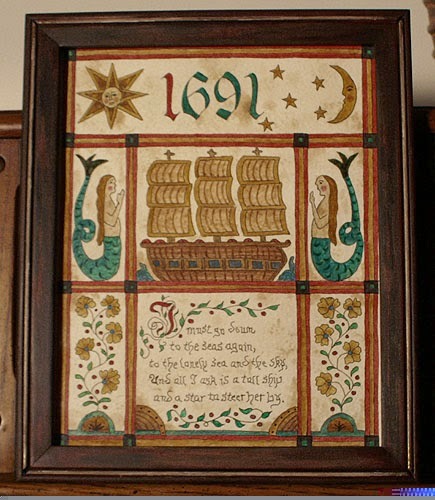 This fraktur is one I did from various fraktur designs and added a saying. One of my favorites. Another thing that I used to do is Scherenschnitte, the art of paper cutting. I can't remember if I sold this or gifted it. I haven't done these in ages, getting hard for me to cut with precision with my nerve pain. This weekend I got lucky at the thrift store. I found a quilting book so I have patterns I can use on my quilts and a yard of General's Wives fabric, a nice addition to my civil war stash. This week I worked on a wall hanging, using a design by Jennie of Elefantz. 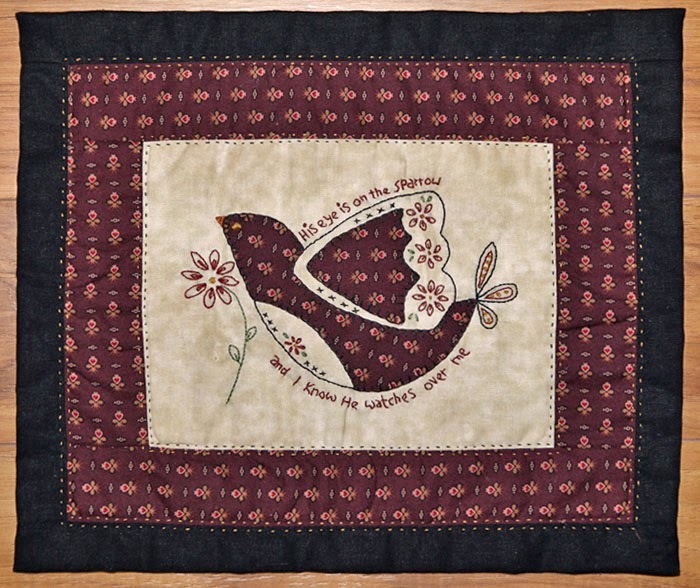 She offered this design on her blog and you can still find the free design, along with other inspirational sayings. 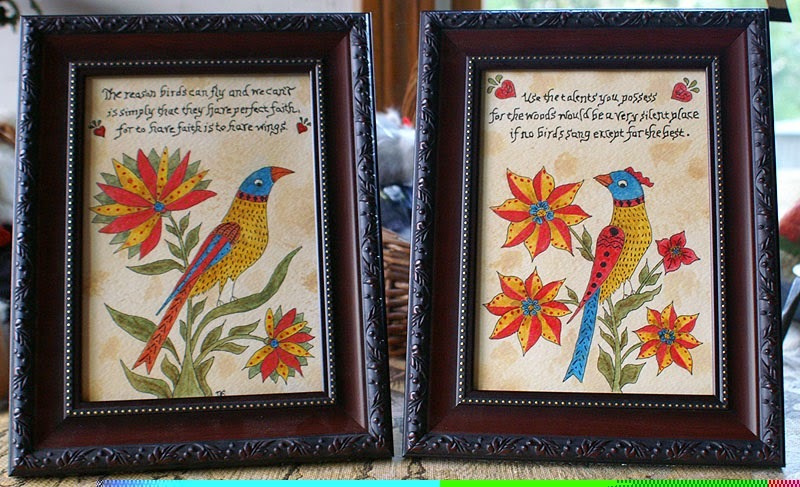 They are wonderful designs to make for a friend who could use some comforting words. I wanted to get an outdoor photo but it was too windy today. The fabric I used is a dark red/purple, so it all depends on your computer screen. I did the fabric appliques with raw edge fusible. Another thing I did was a small fraktur piece. I found a pack of watercolor postcards and wanted to try one with a simple design. I used watercolor pencils and then I used a bit of gloss medium on the colors so I could antique the background and it kept the colors from running but with flash it cast off too much glare. I was thinking this would be fun to do and send to friends, but not sure how well the card would hold up, especially if it got wet or torn. I usually use regular watercolors so I can get better colors and shading, but this was a practice run to see if I could keep my hands steady for the ink outlines and painting, not too bad for a rush piece. For the next one, I will antique the paper first, then use a spray finish to protect the whole card. Would you like to be a card tester? Leave a comment that you would like to receive this card and I will pick a winner and announce it on Monday night. I will mail the card to the winner and we shall see if it holds up or gets ruined in the post. Sorry, but this giveaway is for US post, only. 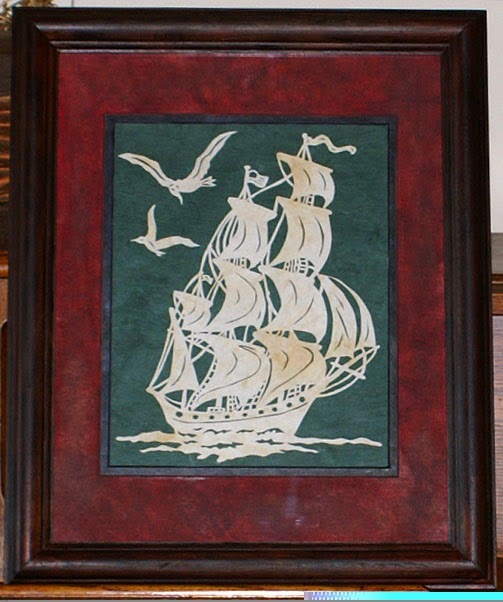 Karen of Log Cabin Quilter used my new pattern to make a wonderful wool applique piece. She made it into a fun piece with the pink wools and the beautiful shades in the homespun for the border. 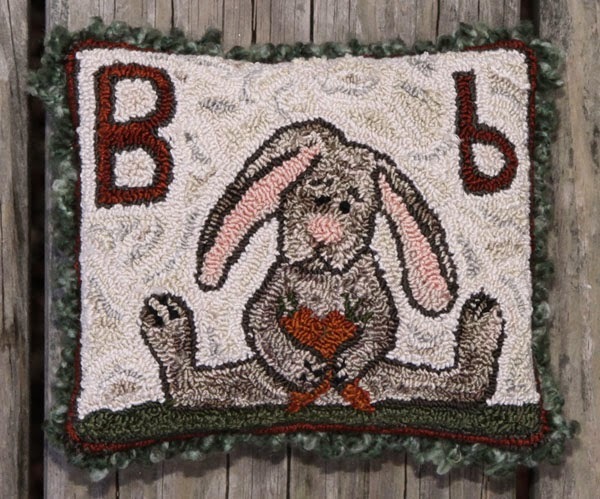 I love how she also used a textured wool for the arms to give the bunny more shape and definition. Karen sent me a photo and I tried to lighten some so you could see the details but it is hard not to lighten other colors too much. I can imagine how wonderful this is in person, wool always looks better in person. We had wonderful weather on Saturday, it actually went over 50 and I wanted to get out and enjoy it. We went for a nice ride down the back roads and checked out the rivers, did a little shopping and ended the afternoon with a visit to my son's house. Of course we all know grandma just wanted to play with the baby outside, lol. Mom was working so I took Nicholas for a walk along the river, they have a wonderful neighborhood to walk in. 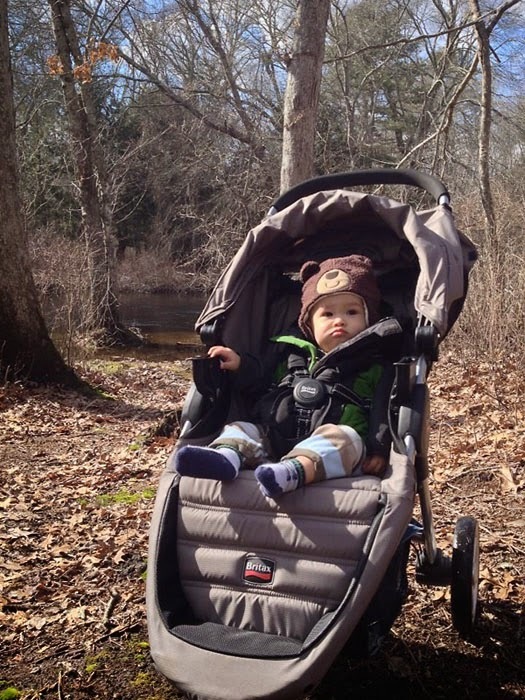 He loved going for a nature walk. I hope everyone got to enjoy one good day, spring is coming! This week I wanted to make something new and fun so I started doodling and B is for Bunny was the result. He was fun to make and has a wonderful character to put a smile on your face, we all need that this winter. He is a nice piece to do in any medium and can be done in a prim style or even for a babies room. I wanted to keep my piece simple so you could see the design clearly but between my bad punching and the fact that I raised the height and forgot to put it down, it has a sculpted, scrappy look. Even with all his flaws, he is a fun piece and by using the bumpy yard around him, he makes a nice pillow. 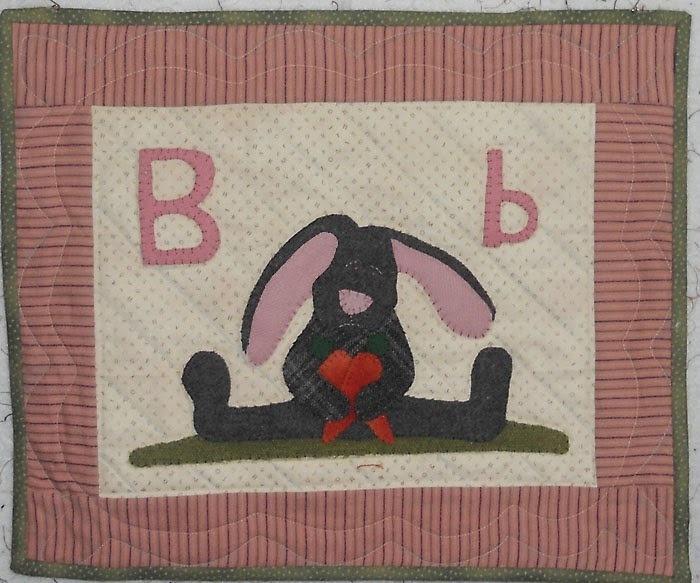 If you would like to make your own bunny piece, you can get my newest Epattern by clicking on the link to the left or visiting my ecrater site. 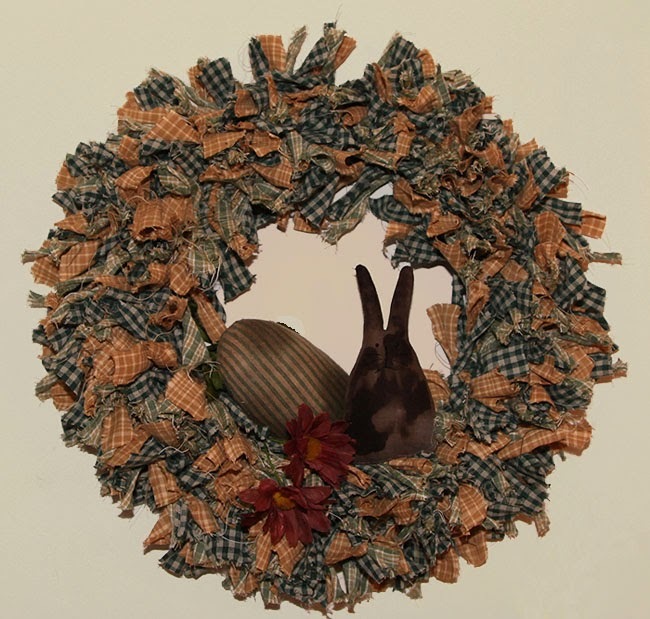 Another piece I finished this week was a smaller rag wreath. This one I used homespuns that I didn't want to use for quilting since they were too thin, but perfect for a wreath. I also tried staining bright pink flowers for my larger wreath and one came out a darker color, so I added that and a few items to decorate the new wreath. I have been wanting to make some little bunnies to add in my baskets and bowls, so today I tried a couple. The pattern I got the idea from is from a russian site, but it does have a translator on it. The site is called Full Moon: The Edge of the Soul and she shows you the ones she made and a little tutorial, but it is easy enough to figure out and I just drew up my own template and used that. I think it is a great design to have fun with and make with different fabrics and change it to make it your own or custom make it for others. Another idea that I got from Urban Threads is to make little bunnies and give them as gifts. She makes up little bunnies and leaves them in places like a library shelve, for someone to find. She adds with a tag on hers with a name and information on the bunny, sounds like fun. You can find her bunny design and idea under freebies at Urban Threads. Here are my two bunnies. I had to put the faces on after I made them, so next time I have to remember to do that first, then I can use buttons or beads for eyes. 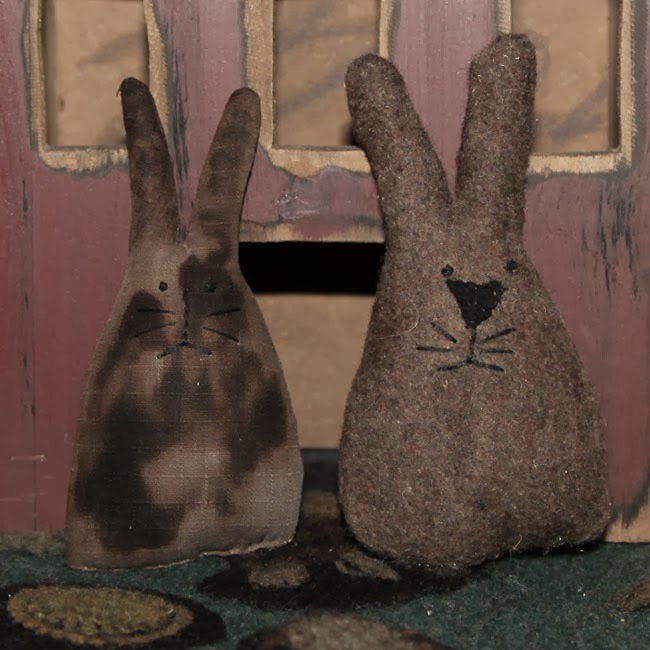 The bunny on the left was made from my old pant material and the one on the right is a felted wool that I found in a thrift store, so great for scrap fabrics too. I couldn't tell how much walnut stain I had on them so the one bunny came out with dark spots. This week I worked on a small piece to hang on the wall. I enjoy doing smaller pieces, something I can work on while I relax and finish in time to enjoy for the season. I really like this design, it reminds me of a Warren Kimble painting and looks nice on the wall. 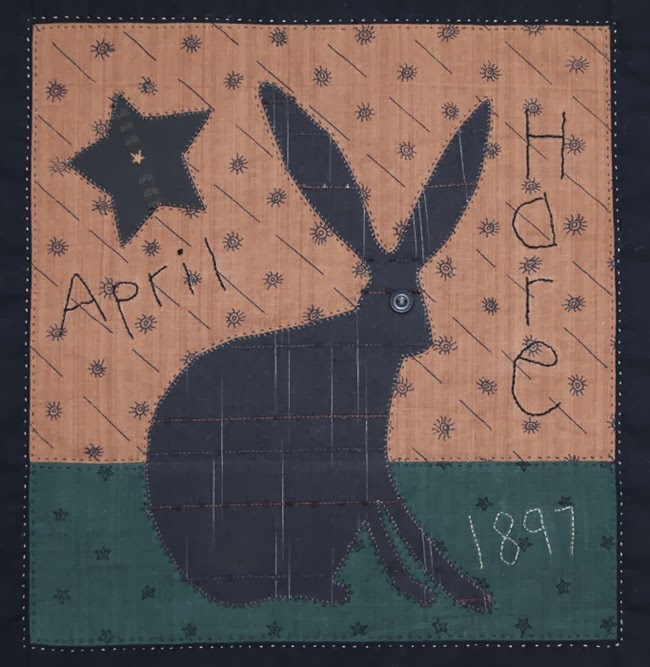 The design is by Sarah Sporrer and part of her Folk Quilt of the Month. The patterns are older but if you do a search for her patterns, there are still some for sale. 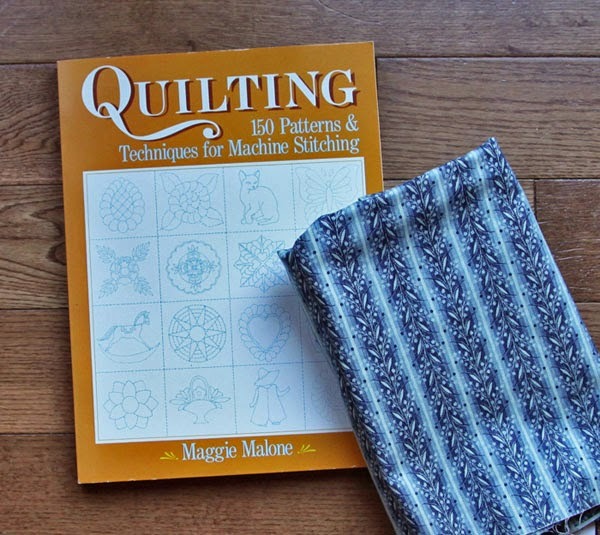 I was lucky enough to get some of her patterns from my friend Karen. You can see the bird piece as her banner, I think I will do that one next. I decided to try something different with mine. I used the yarn dyed japanese taupes for the appliqués and some older fabric that was similar in weight for the background. I really like how it came out and I think this design would look nice in a pair with different color schemes. I cropped some of the border so I could get a closer look at the details on the fabric. The appliques are a black shade but the flash left it a bit lighter. For the applique, I used lana wool thread, which appears white as well as the green for the date, flash is not a quilts friend. For the words, I used a #5 dmc cotton thread, I like how it sewed, and shows up nicely on the background. If you would like something fun to do for the week, Kaaren has her Friday Freebie and it is a fun piece to do for Easter. I hope everyone has a wonderful weekend. And today is my son's birthday, he turned 32 today. 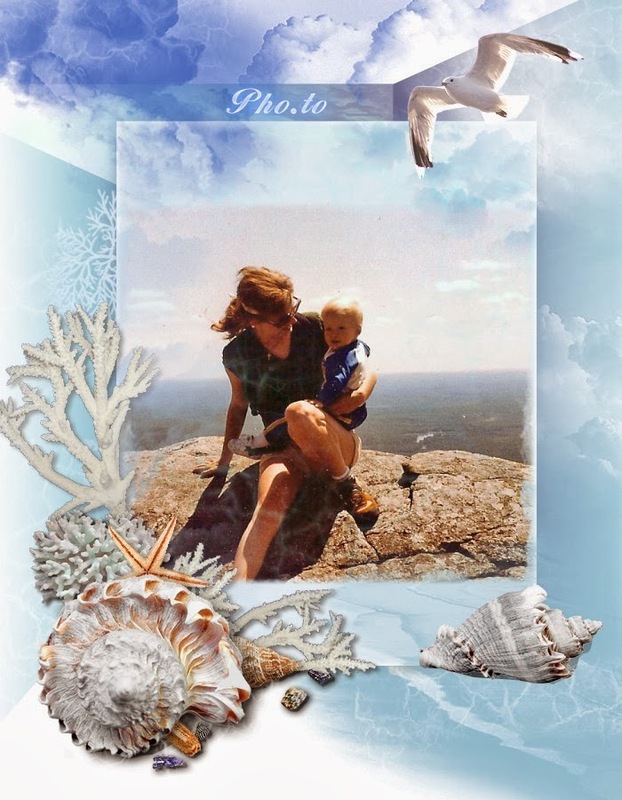 I found this photo of us when we went climbing up Mount Monadnock in New Hampshire. He was almost two and Bill and I took turns carrying him up the mountain, he was that light. 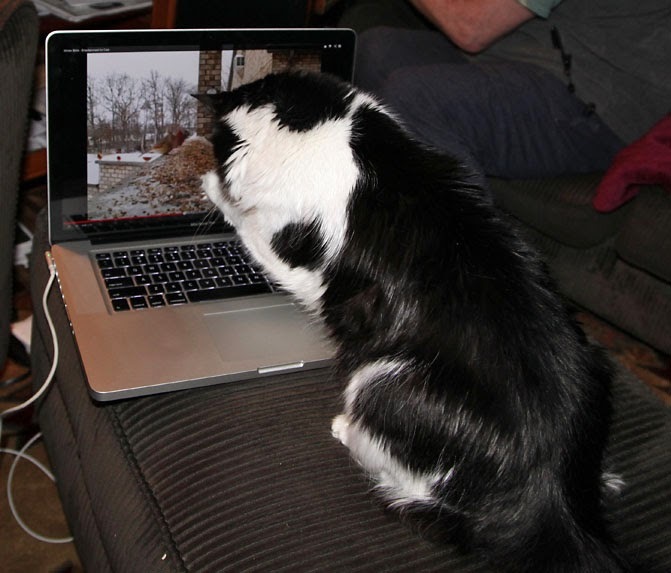 When I have time or need a rest, I love to browse blogs and find new designs that I can make and share with others. 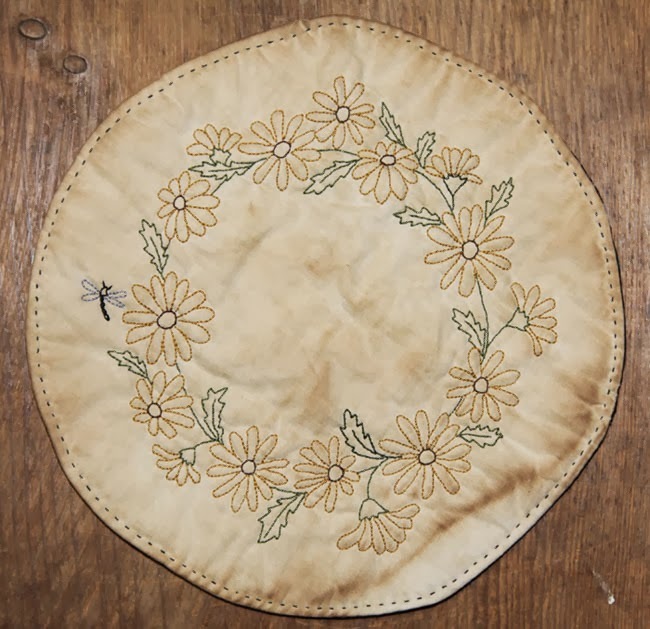 Last week I found two wonderful circle designs that were perfect for spring and you can make them too. 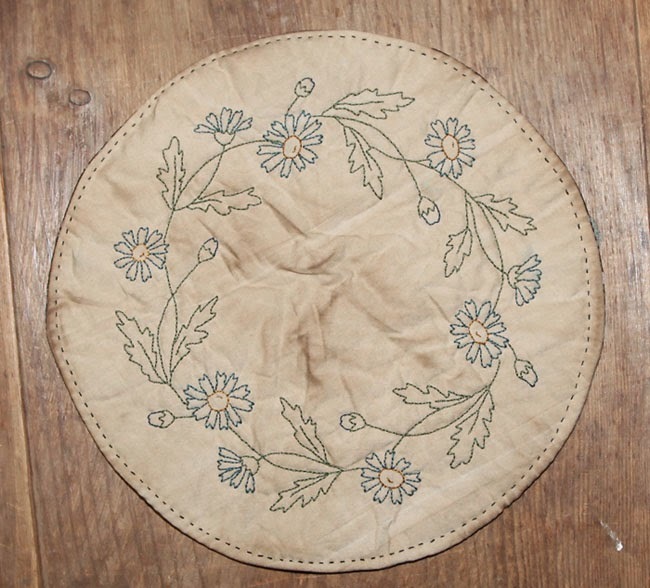 To make a candlemat, I trace the design on light colored fabrics and stitch with DMC floss. When it is finished, I use a clear plastic lid that is larger than the piece and trace the circle around the design. Then I mark off a half inch with dots around the circle and cut out along that line. This gives you sewing allowance and room to add an outer stitch. I also use a piece of batting and do the stitchery with that on, it gives more definition and hides any stitches you need to carry. The design for this mat can be found at Crafting With Jack. He actually has two, so you can make one for yourself and one for a friend, they make wonderful gifts. On this piece I used tea stained muslin and Distress it. It was nice since I didn't water it down, but you do have to use more of it to get a bit of staining. On this mat I used white Kona since I wanted to use a gold for the flowers. It was also stained with Distress it. I think I like this one the best, the colors show up nicely and the dragonfly is a nice little touch. You can find this design at Humming Needles. This weekend my husband was sick and my daughter was home and I was sick and taking care of them, so we stayed in and rested. I got a bit bored so I decided to amuse myself, or should I say Izzy. She was so funny and when the birds flew away she was looking up and around for them.